Children of all ages can create crafts to show Mom how much she is needed, loved and cared about by her children. Hershey’s Kisses are tasty and fun treats to use when making gifts. Kisses can be used for decorating purposes only or to be eaten when Mom needs a little chocolate pick me up. Make Mom a tasty bouquet of flower shaped rosebuds by securing the flat side of two Hershey’s Kisses together with a small piece of two-sided tape. Have the kids wrap the candies in a piece of kitchen wrap leaving it slightly longer then the point of one Hershey’s Kiss. Wrap a piece of floral wire around the wrap and cover the wire with green floral tape. Create a leaf by tying a piece of green ribbon at the bottom of the Kiss where it meets the wire. Create several and place in a glass vase. Handmade gifts made especially for Mom are items that will last her a lifetime. Have kids create a poem or draw a picture for his Mother and glue it to a piece of heavy cardboard. Glue Hershey’s Kisses all the way around the outer edges of the paper to create a frame. Re-purposing old jeans is a great way to recycle and create a Mother’s Day gift. Provide kids with a pocket that has been cut off of an outgrown or worn out pair of jeans. Have her glue beads, buttons and silk flowers to the pocket. 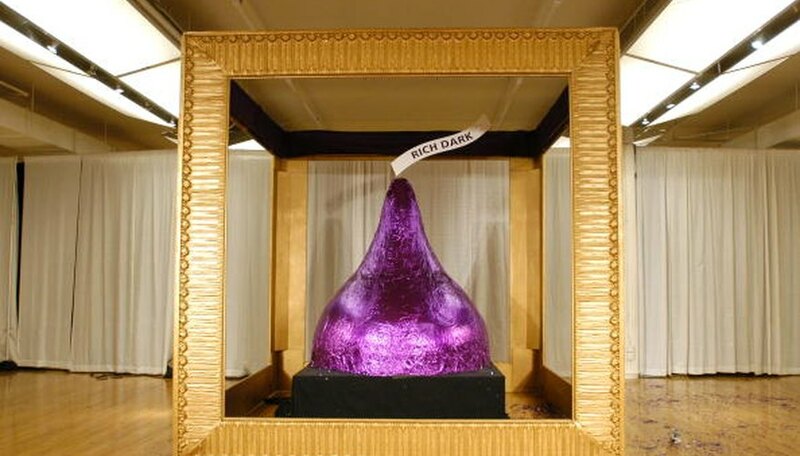 Fill the pocket with Hershey’s Kisses and attach a card to the pocket that says something like “Mom, here is a pocket of Kisses just for you”. Inexpensive plastic spoons and Hershey’s Kisses can be used to create a fun Mother’s Day gift. Use a piece of two-sided tape to attach two Hershey’s Kisses to the middle of the spoon. Have the child cut a heart out of cardstock and write something like "This is a spoonful of Kisses for you Mom." Punch a hole in the heart and tie it around the spoon with a ribbon. Since Mother’s Day is celebrated in the spring, create for her a fun pinwheel or two. Provide a child with a square piece of paper and have her fold it corner to corner so that she has four creases. Unfold the paper and have her cut along each crease until she has cut 1/3 of the way. Bring each point to the middle and have her push a pin through the center and into a thin dowel rod. Have her glue the flat end of a Hershey’s Kiss on top of the pin. Kids can create for mom fun edible mice by gluing a one-inch red or pink crafting foam or felt heart between the flat end of two Hershey’s Kisses. Have the child attach two small self-adhesive googly eyes just above the pointed end of one of the Kisses. Attach a very small black pompom to the tip for a nose and small pieces of black string for whiskers. Lastly add a piece of yarn to the other Kiss' pointed end for the mouse’s tail. Lay the mouse on a piece of paper with something like "You are the mouse perfect Mom in the world."